Even as we revel in the All Saints’-All Souls’-All Brackets’ triduum, the entire world is still basking in the glow of Anna Alexander’s victory in the quest for the Golden Halo last Lent. As you certainly know by now, she was a deaconess. What’s one thing deacons do? They dismiss people. So whatever you were planning for today, you are hereby dismissed. 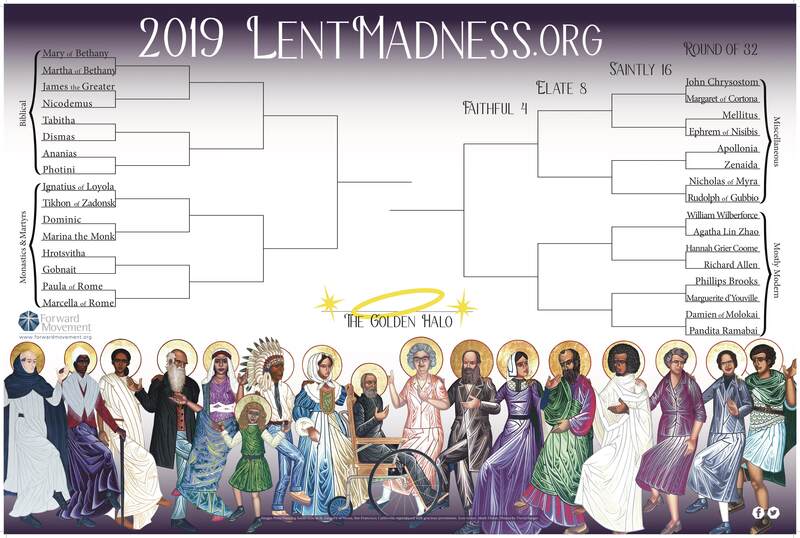 The Supreme Executive Committee is pleased to announce the 2019 Lent Madness bracket! (to read it, zoom in, open it in a new tab, print it out, or get a magnifying glass). We know you’ll want to cancel your plans and spend the rest of the day poring over every saint and every match-up. Also, since you have all that leftover Halloween candy, we know you’re going to want to throw a special All Brackets’ Day party. This year is the Tenth Anniversary of Lent Madness! Hard to believe it’s been this long or this fun. Like last year’s bracket, this year’s bracket is broken up into four quadrants of similarly grouped saints. These are 1) Biblical Saints 2) Monastics & Martyrs 3) Mostly Modern and 4) Miscellaneous. If you want the inside scoop on the bracket, your prayers have been answered. This coming Thursday evening, November 8, the entire Supreme Executive Committee will be on Facebook Live to share Epic Bracketology with you and the entire world. Just go to the Lent Madness Facebook page on Thursday evening at 8:00 p.m. Eastern time to hear about the bracket. It is rumored that Tim and Scott will even answer viewer questions live on the air. Now, that’s not the only important thing you need to know. It’s time to order your bracket posters and scorecards. 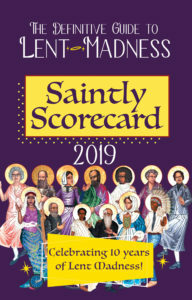 Read, mark, learn, and inwardly digest all the saintly matchups by pre-ordering the 2019 Saintly Scorecard. Just like last year, we are selling the scorecards individually or in packs of 10. To get the best price order three or more packs of 10, for an unbelievably low price of just $1 per scorecard. Pre-order your giant 2019 Giant Bracket Poster. Remember, if early Christmas decorations are bumming you out, you can confound everyone by wishing them a Happy Lent! 44 Comments to "Happy All Brackets’ Day!" From one of the church militant in Canada to all the saints of the church militant in USA – especially my fellow saints in San Diego – Happy Brackets Day indeed. Looking forward to seeing how Tuesday’s choices work out, as well as Thursday’s bracketry. It’s going to be an exciting week. Hi, Simon! An exciting week indeed. And a Happy Brackets Day to you folks in the frozen North. Glad you guys are on the ball!!!! Oh, come on. Mary and Martha have been competing against each other for long enough! My thoughts exactly! Really you have to pit sisters against one another???? I nominate St Anne, Mother of the Blessed Virgin Mary. St Anne is rarely mentioned, and yet she gave birth to and nurtured the Mother of Jesus. What a remarkable women. She’s also the patron saint of grandmothers…and of my hometown, Detroit! Oh happy day! Thankful for All Brackets’ Day. Your timing is exquisite, coming just before the clocks change for many of your fans. Many thanks for giving us something to look forward to during the dark winter. We appreciate all the hard work that goes into this splendid effort. Hail thee, All Brackets’ Day! Blest day in the time of Lent Madness! Day when the SEC reveals the brackets to us! Now that tune is in my head next to “I sing a song of the saints of God” from yesterday…. In your copious spare time, please O please add a “LIKE” feature to these comments? It is so frustrating not to be able to appreciate the brilliance and wit displayed here. What about appointing the plus key as the Official Like Button of Lent Madness? Dismas is in!! The patron saint of being in the right place at the right time! Thank you! Oh boy! I’ve been nominating Ananias (of Damascus) for years. Ananias for the Golden Halo! What a pairing, Nicholas, Santa Claus, and Rudolph, patron saint of reindeer, I assume!! Blessings from Ottawa Canada, one of the homes of St Margeurite d’Youville! Happy Brackets Day! I can’t wait to get my poster! There is a typo on the poster though, on the right hand bracket the Mostly Modern and Miscellaneous are mislabeled (Miscellaneous should be on top). When when when will it be Guinefort’s year?! Some oldies but goodies on the list. Pretty important to our liturgy even if they were boys. And their anonymous momies must have been proud. Just saying. So many saints, so few brackets. Whoever Gobnait is, s/he already has my vote. I nominate him/her Patron Saint of Middle Earth. Deacons do indeed dismiss the congregation to go out to the world, but we do more than that, liturgically, pastorally, in the church and in the world. I am sure you know that, but you have some readers who may not. The print was so small that I had a hard time reading some of the entrants. Is there a saint who heals the blind on the draw? Happy All Brackets Day from Pocatello, ID! Agreed on Mary and Martha- they’ve competed against each other and competed. Talk about sibling rivalry… I’ll also have to remember to start wishing Happy Lent! I went into a local Dollar Tree in Pocatello to find a secret sister gift for church women’s group and they already had box after box out of Christmas and customers had an absolute maize to dodge in one section of the store! I was looking for a little something for All Saints Sunday or pretty Fall decor and things had already been grabbed in a close-out sale. If I happen to go back to that store I will definitely use the Lenten wishes! At our monthly Daughters of the King chapter meeting, I was asked to share a devotional and prayer. Since it is All Saints weekend, I shared the story of Anna Alexander from my Lent Madness booklet. We have adopted her as our patron saint for 1 year. Thank you for sharing her story of courage, devotion and servanthood with us. She set an example worthy of emulation! once again no Mr. Rogers. I hope the movie made about him rakes in millions. I do hope he makes the cut some year! Having also now just come across the post on Facebook about placing a bet on the winner of the golden halo- I vote Nicholas of Myra first choice, St. Ann- second choice. Happy All Brackets’ Day!! Thanks for St. Gobnait-now I can bee happy. (Patron Saint of bees and beekeeping) Looking forward to learning about the all the other Saints and the Madness! OMG! So forthcoming and early. The saints of “All Saints Day” would be proud of you all! Is there a 2019 match-up calendar? Does each day open a little door to find two saintly chocolates in the image of the Saints du jour? OK, I’ll settle for a downloadable, printable match up calendar. Please? Great selections. However, I will continue to nominate the beautiful soul, Amy Carmichael, missionary to those in need in India, and spiritual writer and encourager of those seeking a daily walk with our Lord. As I read some other comments, Mr Rogers sounds like a good choice to mix in with some of the old-timer saints. I would like to see the runners up from previous match up on the rotation again. Some of the saints you are featuring are very obscure and lackluster. It should be more like the real March Madness.